The attorneys are well respected for how they present themselves at court and by their clients for their honesty and hard work. “A successful attorney-client relationship is built upon achievable goals and mutual expectations”, according to Kenneth Carp. 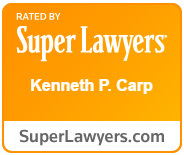 The attorneys at the Law Office of Kenneth Carp don’t do everything, but what they do, is done well. Mutual respect is a key ingredient between our attorneys and our clients and we maintain that respect by having you talk to your attorney when you call and not an administrative person. You work hard for your money and we believe in fair pricing, striving for you to receive value for what you pay. Whether you hire us to represent you for a speeding ticket or a wrongful death case, we work hard for you. You work hard for your paycheck and so do we. Kenneth Carp has handled cases that have been resolved for shy of $1,000,000.00 as well as smaller cases that other attorneys would not take. We treat everyone the same. Over 25 years the Law Office of Kenneth Carp has had clients and their family members coming back or referring others to it. According to Kenneth Carp, the reason is simple “We work hard and treat our clients with respect”. It’s rewarding that so many people call and say “Ken, it’s your favorite client calling.” We respect our clients and they respect us. That’s why I coined the term “lawyers For Life”. (636) 947-3600 or e-mail me at kennethcarp@kcarplaw.com.